Thanks Florence they look wonderful. I like the "mound" of icing sugar, a very technical term! Everyone must read my mind in the world of blog! I was going to leave a request for the recipe but got side tracked by fish & chips last night. 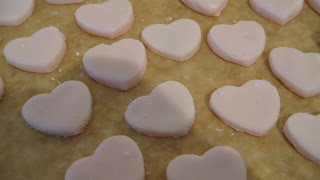 Will have a go at the peppermint creams late next week after I have gone to the local sugar factory for 'mounds of icing sugar'. These look delicious. Will have to remember them the next time Bubbaloo is with me. I am also a lover of the "one for me, one for the plate" method - it not only works with distribution, but of course with collection also - especially at the time when picking raspberries....or strawberries...or anything really! 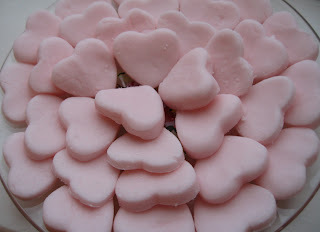 this takes me back, i don't think i've made peppermint creams since brownies! !, i remember, we coloured them green and made little circle shapes, not nearly as pretty as yours. green ones resemble toothpaste a bit too much for my liking!! I think I'll try again, thank you for the recipe! Yum! I can't wait to try this recipe, thanks for sharing. Just found your site. Those peppermints looks positively perilous to eat - good for my tastebuds, not so good for my hips. I love the pastel color. Looking forward to reading some more of your site. on a side note,where did you find that chalk pencil that you sent to ali?I want to ask my sister to add it to my ever growing list of supplies that she will be lugging over the big pond in a few weeks!! Popped over from Crafty Crow. These sound delicious and look beautiful. Thanks for sharing! ming in from The Crafty Crow with many others. Such a great simple recipe. Looks divine. I'm heading to the store today for peppermint and pink food coloring. Thank you! Coming in from The Crafty Crow with many others. Such a great simple recipe. Looks divine. I'm heading to the store today for peppermint and pink food coloring. Thank you! So decadent! And such a sweet gift! Absolutely lovely little treat! Thanks!! I just found your blog. Lovely. Think I am going to have to stop by and see what you are up to. Is icing sugar the same as powdered sugar. I want to make these. They look great and I love peppermint. These peppermints look sooo good!!! We made these and they were yummy! We dipped ours in chocolate too, extra good. Thanks for the recipe. I'll have to give these a try. 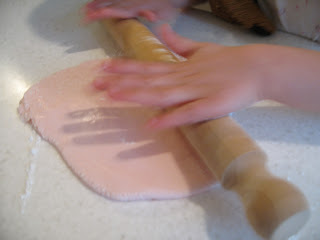 And can't resist the little hands using the rolling pin - always makes me smile no matter whose little hands they are! Oh Florence, dear Florence (My grandma's name! 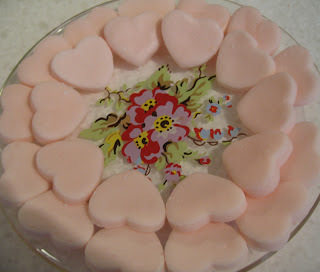 :D) My Mom used to make wedding cakes for a little "pin money" and she used to make these exact candies in a beautiful rose shaped mold! (We call them "soft mints" in Illinois, where I'm from originally. I'm in Newcastle Upon Tyne now, go figure! :D) Anyway, she always had to make extra and hide the "Wedding Ones". :D Yummy, yummy, yummy. That sort of distribution method entirely works for me - as does the somewhat 'give it a whirl' type recipe. You can consider 'em 'whirled' by week's end. (Hearty thanks). This contains raw egg white? Anonymous - indeed it does. I always choose organic, free-range eggs & have never worried over the raw egg white. However, it's a matter of personal choice.